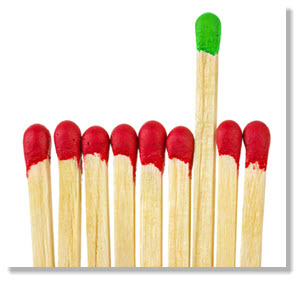 Selective and proactive use of match types (broad, phrase, exact) is a key technique in optimizing the performance of Google AdWords™ campaigns. Unfortunately, many less experienced advertisers tend to over-use the default setting, broad match, for their campaigns, based on the faulty logic that it will generate the highest volume of impressions and therefore the greatest number of leads. In reality, however, using broad match by default across all (or even most) of the keywords in your search program almost always leads to overspending, because it generates unqualified clicks – clicks derived from prospects who aren’t really searching for terms related directly to your product or service, but who saw (and clicked on) your ad anyway. Eliminating wasted spend – monies spent on clicks that aren’t converting into qualified leads – is one of the best ways to generate higher ROI from your paid search campaign. With broad match, nearly any search query can trigger your ad as long as your search term is included. For instance, if the term you register is “network software,” even someone searching for “social network for software developers” might see your ad. Conversely, the more specific your match types and keywords, the more qualified the resulting traffic, and the less money you’ll waste on people whom you never intended to see your PPC ad in the first place. Broad match is Google’s default option. If you include general keyword or keyword phrases – for example: network software – in your keyword list, your ads will appear when a user’s query contains “network” and “software” in any order, and may include other terms that are completely irrelevant to your specific product or service. Using broad match, your ads will also automatically show for expanded matches. These include plural forms and what Google determines are relevant variations that may not be as relevant for you. When using broad match, consider restricting its use to keyword phrases with at least two words. Single term broad match keywords are frequently less targeted and can drive your cost excessively with little return. If you enter your keyword surrounded by quotation marks, your ad will appear only when a user searches only on the phrase “network software,” for example, with the words in that order. This is referred to as phrase match. Other terms can be included in the search but they must fall before or after your root keyword. For example, your ad would be triggered for the query “open source network software” but not for “network monitoring software.” Targeting with phrase matching is more precise than broad matching and more flexible than the exact match option. By surrounding your keywords with brackets (for example: [network software]) your ads will appear only when users search for the specific phrase: “network software.” This option is called exact match. The query must be in the specified order and not contain any other terms. For instance, your ad will not display for a query on “networking software” or “enterprise network software.” Exact matching is the most precise option and typically generates the least amount of traffic. Although your ads won’t receive as many impressions, the benefit is that the clicks you do receive should convert to leads at a much higher rate. Yet another option is modified broad match. For many B2B marketers, this is the setting that provides the best balance between volume and quality. This match type is designated by putting a plus sign in front of any keyword, for example: +network software. Using modified broad match, your exact keyword(s) must show up in the query, but they can be in any order. No one match type will be right for all keywords and all campaigns. By using multiple match types, and even testing one match type against another for the same keyword, an advertiser can avoid unqualified clicks and determine precisely which terms and phrases are performing most efficiently. Adapted from the white paper, “Top 10 B2B Paid Search Mistakes – Why Your Google AdWords Campaign Isn’t Working & What to Do About It”. To download your free copy, click here. This entry was posted in B2B Marketing, Demand Generation, Inbound marketing, lead generation, PPC Advertising, search marketing, SEM, Uncategorized and tagged b2b search agency, broad match, Google AdWords, match types, paid search, PPC, PPC advertising, ppc best practices, ppc match types, search marketing agency, SEM on June 16, 2015 by Howard Sewell.